The story of a newspaper tycoon told after his death by those who knew him or thought they did, and just a gunshot short of noir, the emerging portrait of Charles Foster Kane becomes only more complicated and contradictory. Remembering the facts of things isn’t the same as remembering the truth of them; as created by star and director Orson Welles and writer Herman Mankiewicz, both Kane the film and Kane the man are cubist, assembled from bits and pieces that don’t add up, a flaw that the filmmakers instinctively understood and were canny enough to make the movie’s point. To the extent that the fragments are threaded by anything it’s Welles himself, with whom the character of Kane has more in common than with the ostensible real-life model, publisher William Randolph Hearst. It was Welles not Hearst who lost his mother at an early age and who, like Kane, compensated by conquering everything in his path at the age of 25, radio and theater triumphs behind him and an unprecedented Hollywood contract in his pocket. The movie becomes bigger than not only Hearst, who didn’t hesitate to try and suppress it by threat and blackmail, but Welles too, because it’s the manifestation of a dream that’s always bigger than its dreamer: The grand energy of both Kane and Welles means to confirm the American Dream—that secular religion of the 20th century purer than the heresies of its disciples—with every moment that questions it. In the end the picture is distinguished most by a crazy kind of artistic heroism that’s as American as the machinations that later defeated its author and cost him more than the rest of his career could pay back. 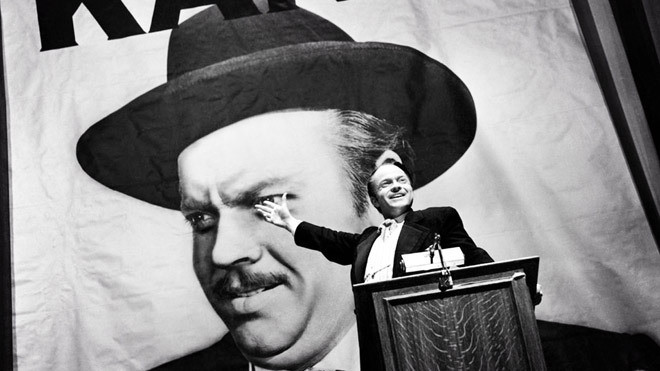 Like his creation, Welles flirted with American madness so as to feel American rapture.